Welcome to my endless search for new containers to store beads. 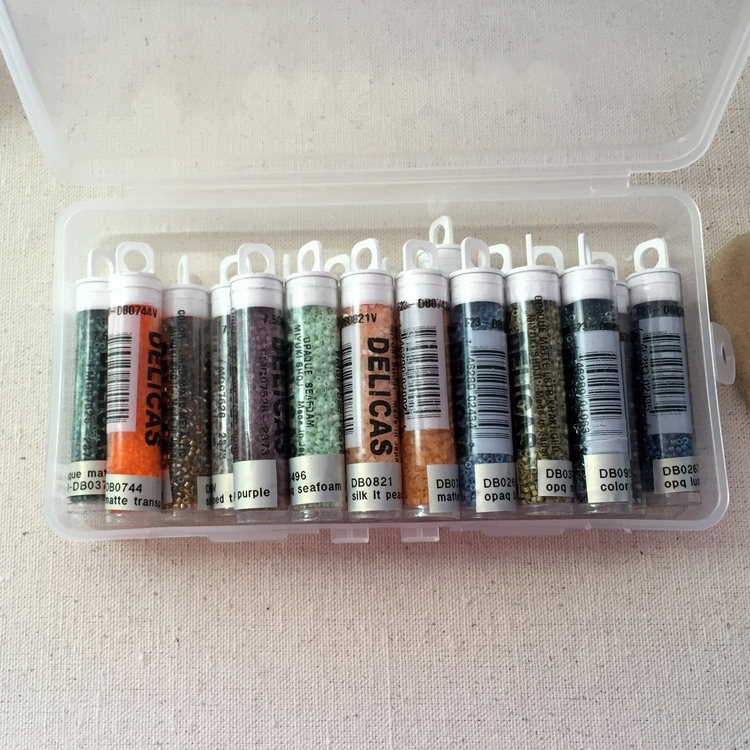 Primarily seed beads this time, but I think these new containers are good for most small beady things including findings. 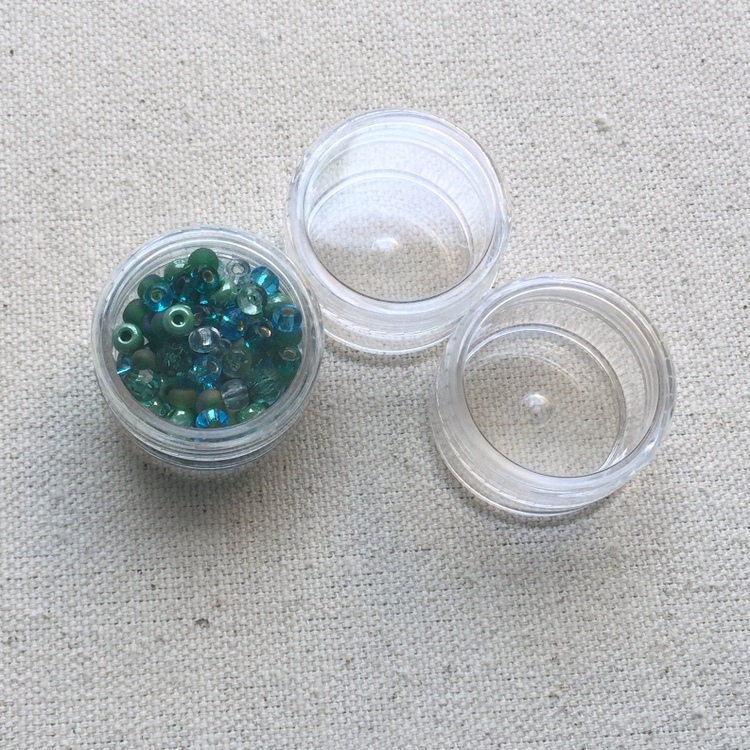 I like that these little containers then store into a nice portable caddy that I can pop in my car for beading on the go or overnights at a hotel. The only thing I don't like about these organizers is that some of the containers have plastic dividers and I would prefer that they didn't. 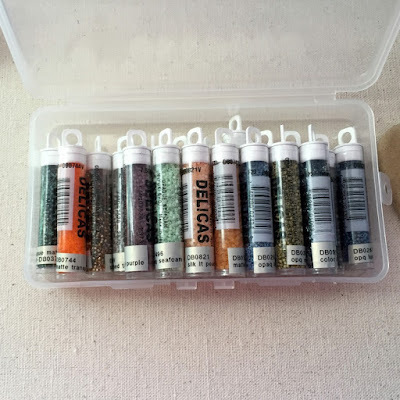 I have worked around it by buying multiple caddies and using the ones with dividers in another caddy to store loose large beads and putting all of the delicas in one, but if I could buy it without the dividers it would be so much better. 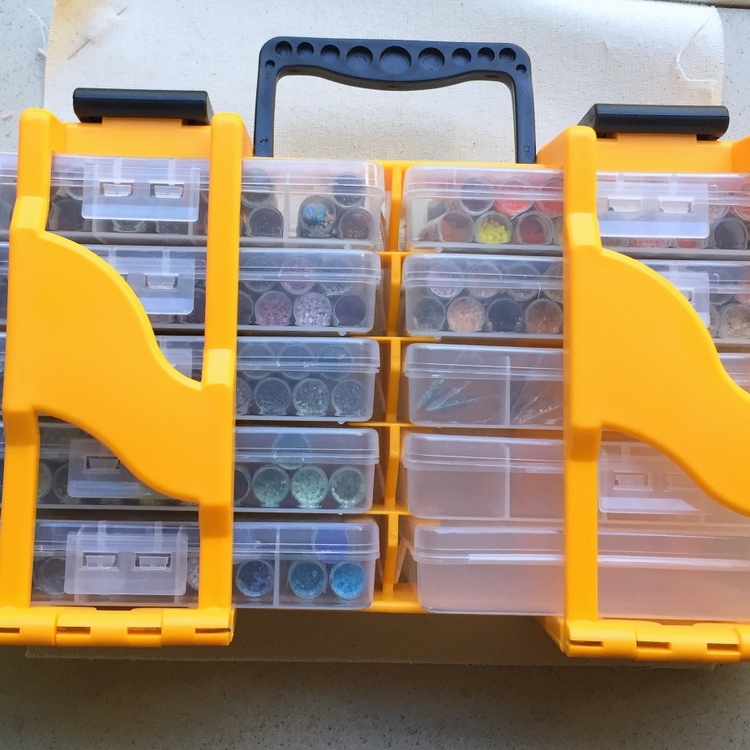 These toolbox organizers are from Harbor Freight by the way, about $10. They've started selling similar items at Michael's but they are much more expensive in a craft store. Harbor Freight also has 20% off one item coupons all the time and they go on sale pretty often too. 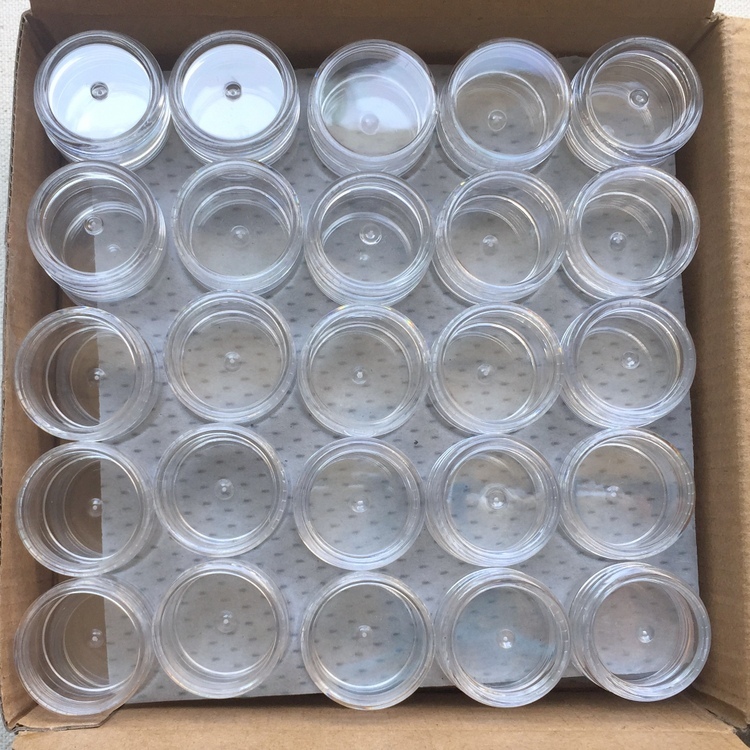 My latest storage obsession are small round clear containers. 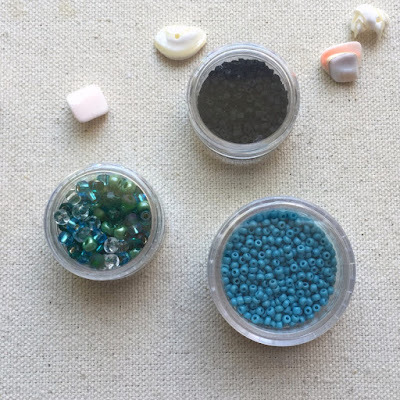 I stumbled across them in a DIY blog post about making lip gloss and thought this would be perfect for the seed beads that come in bags or hanks. I've always hated when I start a strand from a hank and don't know what to do with the rest. They always end up in a bead soup. These little containers are perfect for holding one strands worth of beads from a hank. The smaller size is a 5 gram plastic container and they come in a larger 10 gram container size too. The 5 gram container is in a package of 50 for about $10 and the 10g containers are in a package of 40 for about $14. Both at Amazon, both eligible for Prime Shipping. So, that's my latest storage plans. I still have to figure out what I'm going to put the little containers in, but I'm sure it will be a clear plastic container or caddy of some sort. For right now, they are popped back in the box that the containers came in. It's been nice to move things out of little dishes and bags though. The tops on the new containers haven't come loose either - which is huge!! They screw closed, so I think they will be secure. Today, these beaded leaves are on my bead mat. I am updating the peyote Russian leaves tutorial. It was a pretty big re-write, and I'm still working on adding the new pictures. All the instructions are done though, and the new pictures will be in place this weekend. These are really pretty and not very difficult if you know flat peyote stitch. They use a variation of peyote called diagonal peyote stitch. I've also made myself a new bead mat. This is something else that is always evolving for me, my working surface. I'll post about that soon. If you'd like to know when I publish something new, below are some good ways to find out. Lisa, you can remove those pesky dividers in bead storage boxes by using a sharp box cutter. I do it all the time this way. It only works on the milky/kinda opaque-looking plastic boxes, NOT on the hard clear plastic boxes. Just cut off each side of that divider (wearing eye protection, of course). I use a small sanding sponge to sand off rough edges (don't want it bruising the beads). My advice is to try not to cut out too many dividers in any one box, or it might ruin the integrity of the box! You know... I have been thinking about trying to cut them out. They are the opaque looking ones, and I thought it was possible. I'll just need to be sure to do it on a day when I am feeling patient so I don't try to push it and slice myself by accident. 'Bruising the beads', that give me a giggle.